Oire Nomi are the standard chisel used by Japanese carpenters and cabinet makers. These chisels have a blade length of approximately 62mm(2.1/2") with longer shoulders and tangs. They are well balanced and will take a blow from a hammer for heavier work as well as taking the thinnest of paring cuts for fine work. The overall length is approximately 230mm(9"). 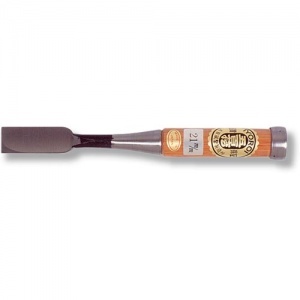 These professional grade chisels are made using high carbon steel (White Paper #2 steel) laminated to a softer low carbon backing steel. They are hardened to over HRC 65 and will hold a razor edge for far longer than an equivalent western chisel. They feature red oak handles, fitted with steel hoops finished with a mushroomed top ready to go.